Looking for unique gift ideas online? Discover the music of The Secret Place! Straight from the heart... and sure to capture yours. Here at The Secret Place we have some great inspirational christian gifts online - special gifts for christians looking for something just a little bit different from mainstream. 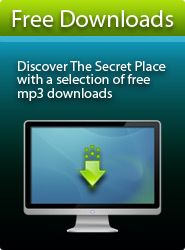 The Secret Place has a special niche in the praise and worship genre. So many of our songs are about God, but few are addressed to Him. These songs are straight from the heart, and sure to capture yours. Looking for Christmas gifts for mum and dad? Christmas gifts for parents aren’t always an easy thing to come up with, especially when they already have everything! You want to say “thank you” and “I love you” in some way that communicates you care for them. The songs of The Secret Place are a wonderful haven of rest. With an emphasis on intimacy and prayer, these songs are sure to capture the heart. A lot of folk want something soft and relaxing but still contemporary. They love the old hymns, but would love a modern alternative to those anointed old classics. The O4eyes2C DVD would make a perfect gift! Preview the DVD trailer below. 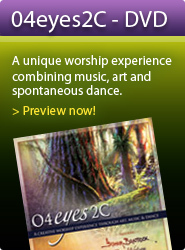 A captivating worship DVD featuring art, music and spontaneous dance. An inspiring artistic journey combining painting, music and spontaneous dance. Read other testimonies of how people have been blessed! "I could seriously feel God's peace ..."
"The music of heaven that you flow with creates an atmosphere that attracts the Holy Spirit ... "
"I was spiritually dehydrated and I was serving God in my own strength. .... Your music has truly touched my life." "There is a sound that comes from heaven that feeds mans spirit.... "
Create a peaceful, restful atmosphere in your home, work or car. Let His Presence take away all the stress life can bring. Check out our free bonus album special! Music Christmas Gifts - We have some unique Christian gift ideas for Christmas available from our online store. "Some of the songs here are practically paralyzing. The second I hear them it puts me into a place of worship and the presence of God."